The first man to free solo El Capitan in Yosemite National Park. “Free Solo” is like no other documentary you’ll see this year, or last year, and probably the next year for that matter. It is an adrenaline laced, anxiety-fueled story with a lot of human touch and heart. National Geographic put all their cards into Alex Honnold, the thrill seeking free solo artist with a death-wish. For those who don’t know, to “free solo” is basically scaling a rock cliff without any ropes, any sort of safety net,. One wrong foot placement or hand movement and it’s a 2,000-foot fall. “Why?” most people, including myself, would ask, and I cannot truthfully answer that question. It’s better to just watch Alex explain it. This documentary follows our protagonist as he attempts to free solo a 3,300-foot cliff, “El Capitan” located in the beautiful Yosemite National Park. This film is gorgeous The cinematography is simple, but damn is it effective. Watch this movie on this biggest screen possible. The vistas of Yosemite are absolutely gorgeous. It’s the closest thing to actually being there. Shots come rolling off rock cliffs, giving the viewer vertigo and anxiety while in the comfort of a seat and your heart will race as you watch Alex and the film crew climb massive summits with a wonderful score that adds even more depth to the beauty. 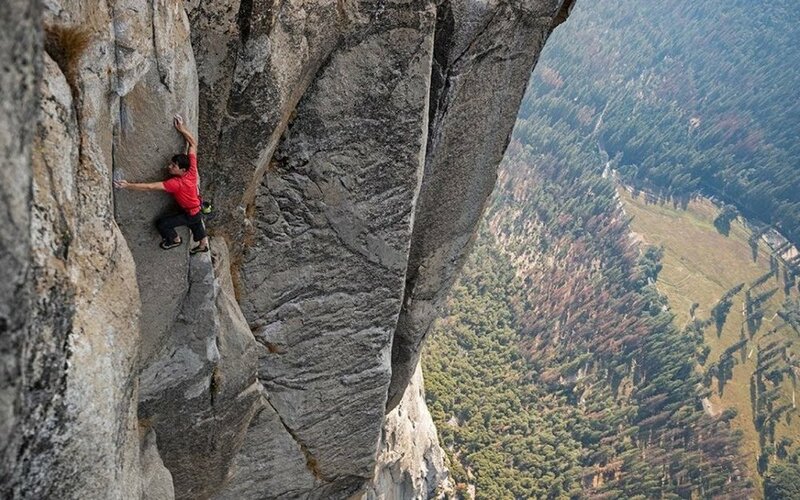 The crew and cameras had to remain hidden, or be absent during the actual climax, when Alex makes the free solo climb making the final half hour that much more gut-wrenching, so get ready for sweaty palms from this intense but ultimately rewarding watch. When we meet Alex Honnold for the first time, he explains what free soloing is and why it’s so much more enlightening than rope climbing, yet the only question I found myself asking again is “why?” It seems like such a high risk/low reward endeavor to jeopardize life with the wrong foot move, or the wrong thumb grab, but Alex is a very intelligent person, he understands what he’s doing and he does it with pride, albeit with a whiff of arrogance. He tells us what he does is simply what he was born to do. It’s his drive in life and one can’t help but respect that outlook. Despite the landscapes, the first thirty minutes or so are hard to grapple with. Alex is much like a robot in his canter. He’s not very relatable. Seems like a nice enough person, but there’s just something off putting. Then we meet his girlfriend Sanni, who really brings the emotional touch to this film. She’s almost the polar opposite of Alex’s personality but it works and makes the story that much more engaging. It brings the drama and the real issues of such a dangerous career choice to light. She brings a new dynamic to the profession and asks the hard questions that even Alex can’t seem to answer sometimes. That new dimension really shapes this movie. The history of this profession is fascinating. In between the present story there are brief facts of when free soloing began, who the leading climbers were, and how basically they all died doing what they loved. It’s all a bit overwhelming as to why anyone would do this but, knowing I never would do such a thing as free solo, learning about it becomes just as interesting as the story itself. The animations are done nicely, showing the crazy routes the climbers would take up these sheer mountain sides. The filmmakers did their research and it’s shown with a great eye for detail. While these history clips are great, there is an unnecessary amount of filler throughout the story. There are times we watch Alex make his food and eat from the same pot and he exclaims what a great cook he is. There’s an unusual scene when Alex and his girlfriend Sanni buy a house. It doesn’t really belong or add any significance to enhancing the overall narrative but these small hiccups aren’t enough to bring this astonishing documentary down. Overall Free Solo is at the top of the climbing/sport documentaries out there, it deserved the Oscar wholeheartedly. The climbing sequences are staggering, jaw dropping, awe-inspiring, and absolutely absurd, you’ll be shouting at the screen with anxiety, it’s a wild ride. The history is interesting and it keeps pace with the present story, although the latter does stumble a bit with too much filler, and it takes a while to fully realize who Alex Honnold is and to appreciate what he does. I recommend this movie to anyone, sport junkies, the average Joe, climbing enthusiasts, hell even the Michael Bay goons will enjoy this one. I give Free Solo 4.5 stars out of 5.